Great shot (pardon the pun), pity about the antique car. 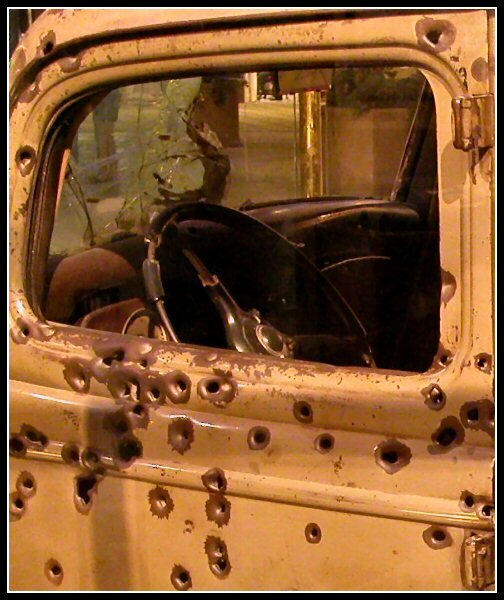 The sharpest focus I'm seeing here is in the bullet holes near the bottom of the photograph in the center. The rest of them seem a bit soft. The shot is interesting though. Love the old look. I think it could definately be something on the front of a magazine, just with a tiny bit sharper focus. Very cool idea. I like it. Good cropping for a magazine, too. It's way to yellow/green. And for a magazine cover, it should be zoomed out more (show more of the car). Talk about your bad days.... the sharpshooter who was aiming at this driver has a cery scattered pattern. Interesting photo! Awesome! Great colors and I love how you framed it. 10. Hmmm...I have a feeling that I'm getting a narrow view of this challenge. This is a very well done photo, but I'm thinking that if I saw this cover on the news stand would I pick it up, finding interest in what I could read inside? Probably not, unless there were other photos on the cover. I don't know if there was ever a picture taken of Bonnie and Clyde, that would be a great cover. The color cast or exposure seems just a bit off, (maybe it's just the actual color of the car, but that's the feeling it give me anyway), but I really like your subject and composition. Creative idea! Proudly hosted by Sargasso Networks. Current Server Time: 04/20/2019 04:30:20 PM EDT.